Today we left Halifax, after three great days with family and friends. I love the falling-back-into-place feeling you get with certain people, where it feels like you saw them last week, even if it was years ago. Those are great relationships. Today's ride was a nice one, a light tailwind and sunny skies let us crank out some solid mileage early in the day, so that we can set up camp and relax for the afternoon. 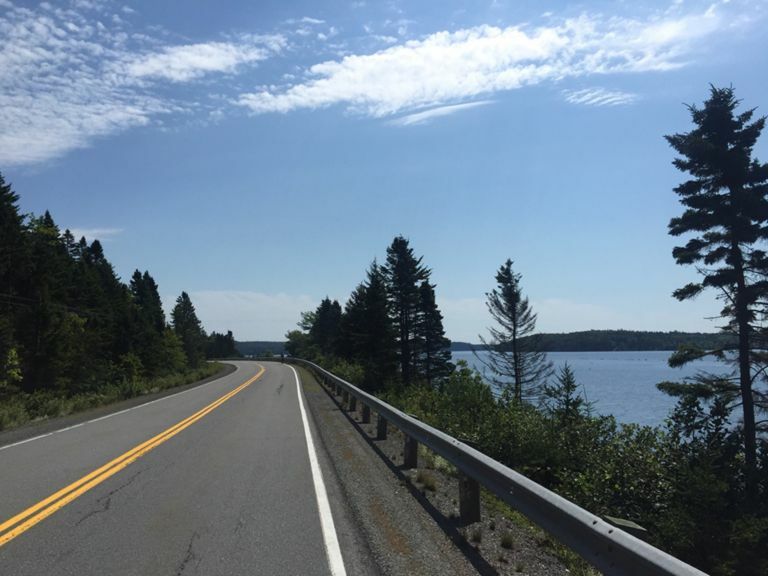 We decided to take the southern shore of Nova Scotia to make our way toward Cape Breton, as the highway follows the coast and we wouldn't need to climb as much, or backtrack at all. Last night we talked about not really looking forward to getting back on the bikes. Four consecutive sleeps in a bed will do that to a person. During dinner my aunt Marg talked about how she loved the feeling of rolling along on her bike with the wind in her hair, and the sense of freedom that comes from self-propelled exploration. That helped me get out of bed this morning for sure. Special thanks to (in order of appearance) Jennifer, Nora, Maya, Edgar, Kristin, Carl, Christian, virtual-Kathryn, Dianne, Mark, Marg, Andy, Adam, and Leeza, who all made for a fantastic stay. Halifax feels like home and I've never lived there.